The Spangled Kookaburra (Dacelo tyro) - also known as Giant Kingfisher or Aru Giant Kingfisher - is a Kookaburra found only on the Aru Islands in the province of Maluku in Eastern Indonesia and the Trans Fly savanna and grasslands of southern New Guinea. This species is uncommon within its range. A shy, reclusive bird, the Spangled Kookaburra keeps to itself. A strikingly beautiful bird, The Spangled Kookaburra inhabits grasslands and dense rainforests. Its bright blue wings and tail, white chest and belly, dark-colored eyes and black head spangled with white make this a spectacular bird to encounter. The wings are several shades of brilliant blue, while the long, straight beak is bi-colored: blue on top and white on the bottom. 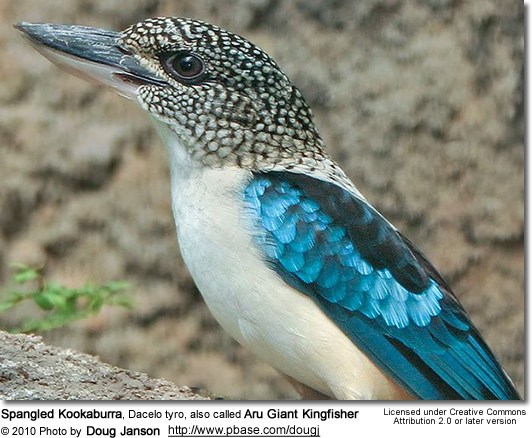 Little is known of the family life or breeding biology of the Spangled Kookaburra. Other Kookaburras nest in hollows in trees, so possibly this bird’s nesting habits are similar. Its feeding habits are most likely similar to other forest-dwelling kookaburras.